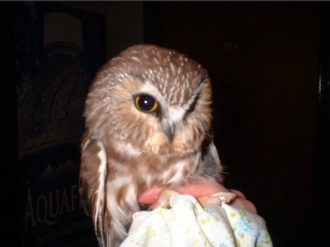 Between 7-8½ inches tall with a wingspan of 17-21 inches, the Northern Saw-whet Owl is the smallest member of its family in eastern North America. Because of its diminutive size and strictly nocturnal habits very little is known about these owls. Their ecology and the over all health of their populations remain a mystery. The Pocono Avian Research Center has become part of a larger network of organizations and individuals called Project Owlnet, a continent wide effort to gather as much information as we can about these beautiful little owls. Between these two distinct periods in the annual ecological cycle of the owls is a period of dispersal and migration. Most people are familiar with the biannual passage of songbirds, waterfowl and diurnal raptors. Fewer people are familiar with the movements of owls and nightjars (whip-poor-wills and nighthawks). It is because of the nocturnal nature of these birds that we are only now beginning to realize how extensive a movement their migration is and how many different species are engaging in it. Almost all owls engage in some form of migration during the fall. In the case of the Northern Saw-whet Owl it is a predictable migratory pattern commonly occurring between October and November. While some owls engage in a regular migration like the Saw-whet, many others move in irruptive flights. These movements generally follow periods of prey scarcity in the northern woods. Irruptive migration is more commonly associated with Snowy Owls, Great Gray Owls, Boreal Owls and Northern Hawk Owls. We know even less about the northward movement of nocturnal raptors occurring in late winter and early spring. The migration is more widely dispersed and harder to track. Please enter information about the species using next boxes in your yard. When did they first arrive? Did you observe the adults bringing nesting material to the nest? Have the young left the box?